It seems everyone is abuzz about bees at the moment… And rightly so – they are amazing animals that are instrumental in our food production via their pollination. And many people are establishing their own hives in areas that bees haven’t traditionally been, all in an effort to increase the bee population. Scientists have mixed opinions on these new hives. Some say it is helping to maintain the population, while others view these new hives as disruptive to already established hives. But, there is something we can all do to help bees that doesn’t involve tending a hive. We can grow flowers that bees love! It’s a good idea to plant flowers native to your area. For us, that includes bottle brushes, eucalyptus and tea tree. 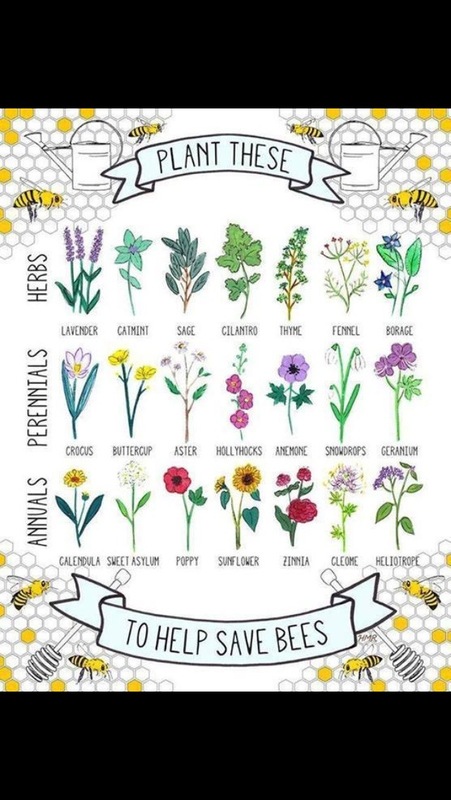 Bees love lavender too, and our garden has quite a bit already, so I’m feeling happy that we’re helping these bee-autiful bees! 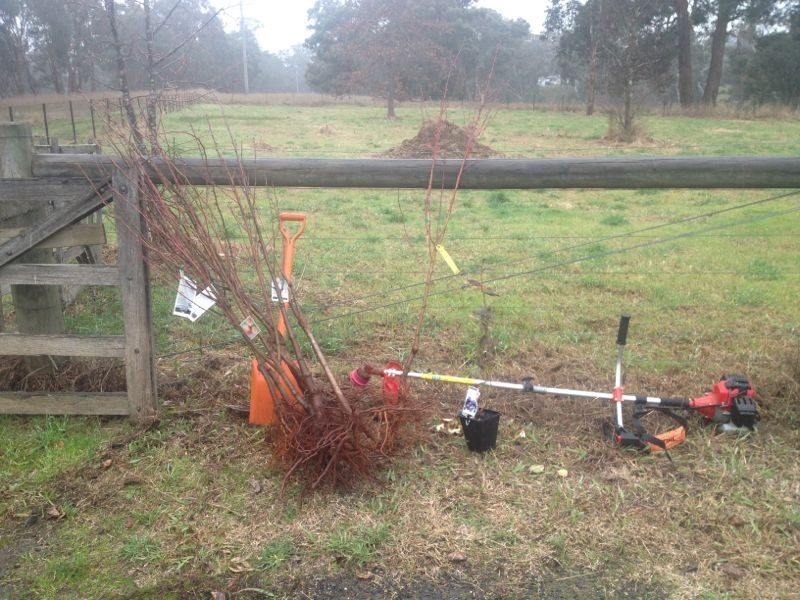 After hours of mowing and wipper snippering, and replacing snapped wipper snipper cord, and then having said replaced wipper snipper cord snap immediately, so then replacing said replaced wipper snipper cord with newly sourced cord from remote-side-of-the-road-stall, I am very excited to announce the establishment of our orchard! Hubby has been busy planting and – TA DA! – here it is! 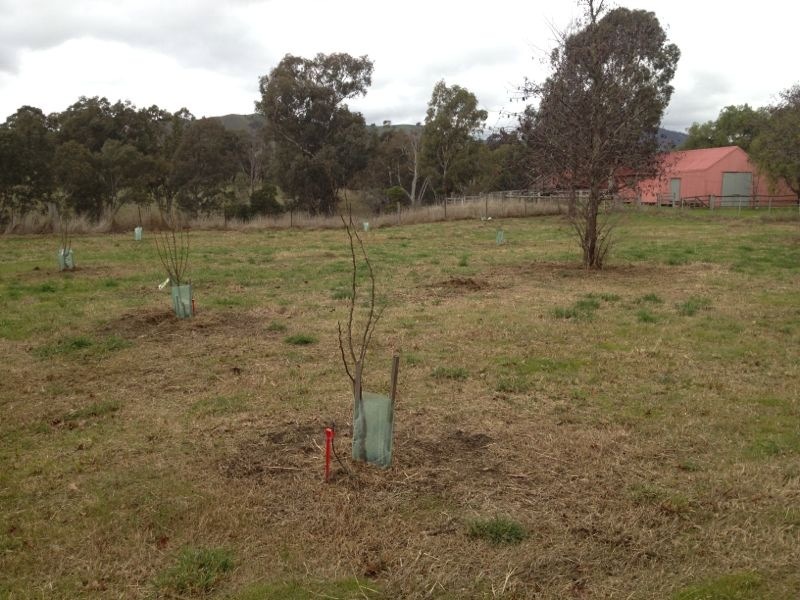 Apples (two varieties), figs, lemons, blueberries and peaches are now ready to get growing! Hubby bought the bare rooted trees at the local market so now we really can stake our claim that some of the inhabitants of Mulberry Tree Farm are from the immediate area. Apart from the importance of being local, I learned that you need at least two varieties of apple trees in an orchard so that the bees can pollinate the flowers which then turn into fruit. The bees knees really live up to their metaphor! We should have fruit by spring so I will be sure to let you know how we’re tracking.